Marvel's Agents of S.H.I.E.L.D., or simply Agents of S.H.I.E.L.D., is an American television series created for ABC by Joss Whedon, Jed Whedon, and Maurissa Tancharoen, based on the Marvel Comics organization S.H.I.E.L.D. (Strategic Homeland Intervention, Enforcement, and Logistics Division). The series is produced by ABC Studios, Marvel Television, and Mutant Enemy and is set in the Marvel Cinematic Universe, sharing continuity with the films in that franchise. It revolves around the character of Phil Coulson, with Clark Gregg reprising the role. 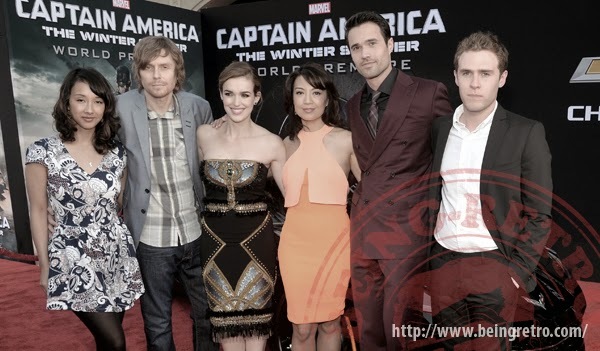 A pilot, written by Joss Whedon, Jed Whedon, and Maurissa Tancharoen, and directed by Joss Whedon, was given the green light in late 2012 and filmed in early 2013. The series was officially ordered on May 10, 2013 and premiered on September 24, 2013. On October 10, 2013, ABC picked it up for a full season of 22 episodes. I am going to be revealing my theme slowly, but you will figure it out quick... cause you all are very smart! Phil is in T.A.H.I.T.I. I love this series. I hope it gets another season. I have never seen it but thanks to this blog I've learned about it and will look out for it. Thanks! I really want to like this series more, but it's just leaving me cold, so far. I think a Cold War/ 60s S.H.I.E.L.D series would have been a better idea. Looking forward to seeing your theme, too! I've never seen this series, but it sounds interesting enough. Now you've got me curious...especially with that old pic from Tahiti. Wow-- where have I been on this news, as a Whedon fan and a Marvel Fan??? Thanks for the awesome entry--jst told my husband too!!! And thank you for your beautiful drawings I am using every day!. jean! Sounds like a great series, and I like the movies, all of them. Too bad I don't get to see the tv. I'm hoping that after the Winter Soldier things get shaken up on the show to keep it interesting. I am enjoying it. I also heard that Disney keeps this afloat despite ratings, because they use it to bring their Marvel universe together. I think many of the people that quit watching should come back. This is a great show despite what anyone says. The theme reveal heats up! Have never seen this show. Great start! Love this show. It started a little slow, but it has really picked up steam in the last few weeks. The current story line looks like it could be great. I'm so glad you'll be able to post, but we completely understand the not visiting part. Healing takes time and I'm glad you're taking it slowly. I love this series as well and do hope it gets a well-deserved second season!! I haven't seen this show! Sounds like one I'll order on DVD and we'll watch non-stop. AFTER I have all the A to Z tidbits from you!! I've seen a few of the shows, they are very well done and interesting! I haven't seen this one yet, but now you have me interested. I can't wait to figure out your theme. I watched the first episode or two but it's on at a bad time for me. I might end up watching it on DVD down the road. I like it a lot - hope it hangs around a while! I'm enjoying the show. It's not holy crap amazing, but its pretty good story telling. I like the characters and the tie-ins with the movies. This one is on our list of things we plan to watch once it hits Netflix. We don't get current TV -- can't pick up any channels -- so all our viewing takes place via instant streaming and disc. We don't typically mind the wait, as there is always something cool to catch up on, but this is one I'm eager to catch sooner than later. A to Z Challenge... the GOOD/BAD and Me!